1. Heat oven to 180C/160C fan/gas. Cut 2 x 5cm-wide strips of parchment and lay them up the sides of a 1.2-litre pudding basin, making a cross on the bottom of the dish. Make sure there is some overhang to help you release the pudding when cooked. Grease again. Lay a square of foil and equal-size square of greased parchment on top of each other, folding a pleat down the middle. 2. 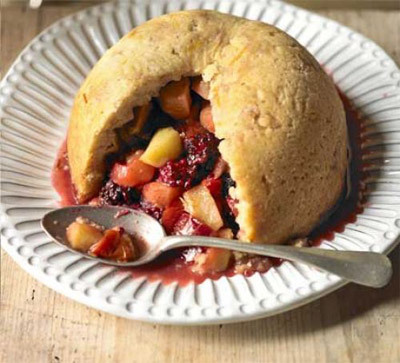 To make the filling, chop plums, apples and pears into 1cm cubes and place in a bowl with the blackberries. Add butter, broken into bits, 125g of sugar and cinnamon. Stir and put to the side. 3. Sift flour into mixing bowl. Mix in suet, remaining sugar and lemon. Add a few drops of water, working it through with a cutlery knife, then keep adding water until you have soft dough. Using your hand, bring the dough together into a smooth ball. Tip out onto a lightly floured surface. Tear the dough into ¾ and ¼ parts. Roll the larger portion into a rough circle, approx 20cm. Drop into the basin and press up the sides until you have a slight overhang. Tip the filling into the pastry case. Roll out the remaining ¼ to make a lid, then press the pastry edges together to firmly seal. Tuck the protruding flaps of parchment down onto pastry. 4. Put foil/parchment on top (foil side up), pressing and squeezing the foil round the edges to make a fitted lid. Tie string securely around the lid, making a handle with extra doubled-up string. Put in a deep roasting tin, then pour boiling water to 1-2cm below foil line. Cook for 2 hrs, topping up water level if it gets too low. Unwrap, release edges using parchment tabs and invert onto a plate.